No, it doesn’t reside in the depths of the Misty Mountains, or mutter “My precious, my precious…” in the dark. 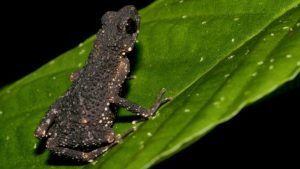 However, the possible fate of a particular toad from Malaysia, that gets its name from everyone’s favorite duplicitous, conniving, yet lovable, precious-coveting character from The Hobbit and The Lord of the Rings, is concerning scientists after becoming the latest to join a list of animals at great risk of extinction. This amphibian, which is known as Ansonia smeagol, was given its name due to the similarities scientists saw between it and Professor Tolkien’s famous creation. The danger comes from the effect of tourist resort expansion on its habitat of upland streams at a mountaintop in mainland Malaysia. You can read more about this little guy, also known as the “Precious Stream-Toad”, as well as other species to make the IUCN (International Union for Conservation of Nature) Red List, at BBC News.